▲ Park Jung-ho, CEO of SK Telecom announced the beginning of the Age of Hyper-Innovation with 5G at the ‘5G Launching Showcase’. SK Telecom stated that its 5G network is the best in terms of coverage, speed and safety. SK Telecom has secured the widest 5G network coverage in Korea. As of 6:00 p.m. April 2, 2019, it has built a total of 34,000 units of 5G base stations. The company has rolled out its 5G network in data traffic-concentrated areas, including main areas of 85 cities nationwide (Seoul, six metropolitan cities, etc. ), university districts, KTX, sports stadiums, expressways, subway lines (Seoul and Seoul Metropolitan Area) and beaches. In particular, it is expanding in-building coverage centered around 120 department stores, shopping malls and airports throughout the nation. Through the application of its self-developed ‘Total In-building Solution,’ SK Telecom provides four times faster in-building data rates than its competitors by utilizing four antennas of a smartphone. With the development and application of 4G-5G dual connectivity technology, SK Telecom’s 5G network supports up to 2.7Gbps data transmission speed, which makes it ideal for streaming and downloading ultra-large volume VR and UHD content. For instance, while it takes more than one minute to download a 12GB VR content via 5G network alone, it takes only 36 seconds to download the same content over SK Telecom’s 4G-5G aggregated network. 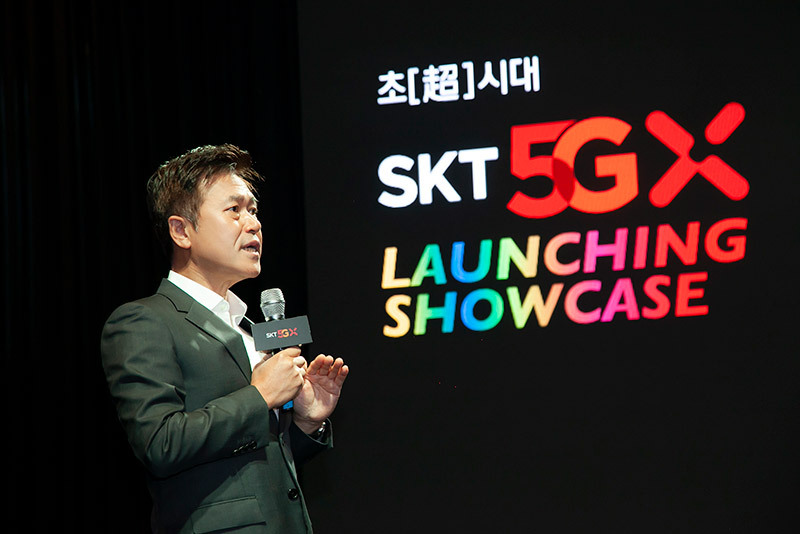 SK Telecom has introduced 5GX price plans to be launched on April 5, 2019. 5GX price plans consist of four different plans. ‘Slim’ offers 8GB of data (1Mbps speed after data cap) at KRW 55,000 per month and ‘5GX Standard’ comes with 150GB of data (5Mbps after data cap) at KRW 75,000 per month. Considering that subscribers to selective contract discount plans can receive 25 percent discount from these prices, their monthly 5G plan costs become more affordable. SK Telecom plans to update its price plans after analyzing the data usage patterns of subscribers of unlimited plans. SK Telecom announced that it has secured around 8,000 different content in diverse areas including game, ultra-high definition (UHD), augmented reality (AR), virtual reality (VR) and communications. The company has also launched the ‘SKT 5GX’ section within its OTT video service ‘oksusu’ to offer a rich variety of media contents that can be experienced via 5G. ‘SKT 5GX’ consists of three different menus namely ‘VR’, ‘5G MAX’ and ‘UHD’. The VR menu provides diverse VR content related to idol stars, sports games and movies. It exclusively offers a wide variety of K-pop VR content to provide K-pop fans with an immersive VR experience to feel as if their favorite idol star is standing right in front of them. It also features one-on-one VR fitness and golf lessons; VR tour of famous art galleries of both home and abroad; and a 360-degree VR trip of twenty different cities in the world including Rome and New York. The company will also alleviate customer’s cost burden by applying cutting-edge technologies like ‘5G Media Compression Technology,’ which reduces data consumption by more than 30 percent, and HEVC codec, which can decrease content capacity by up to 50 percent. Meanwhile, SK Telecom has demonstrated diverse 5G services including ‘Social VR’ and VR games at the 5G launching event held prior to the press conference. The company also introduced EXO, one of the most popular idol group in the world, Kim Yuna, Olympic figure skating gold medalist, and Lee Sang-hyeok(“Faker”), a professional LOL player, as the world’s first 5G subscribers to experience the new world of 5G.